What is it about flowers that intrigue us? Is it their intricate shapes and patterns, or their incredible variety? Is it their symbolic significance, or the way they cue our memories? For me, it’s all of these aspects. Flowers have fascinated me since I was a child. Our family home was in a country town and my parents were very keen gardeners who grew many Australian native plants. So early on I was introduced to the large diverse families of Grevillea, Acacia, Eucalypt and Banksia. 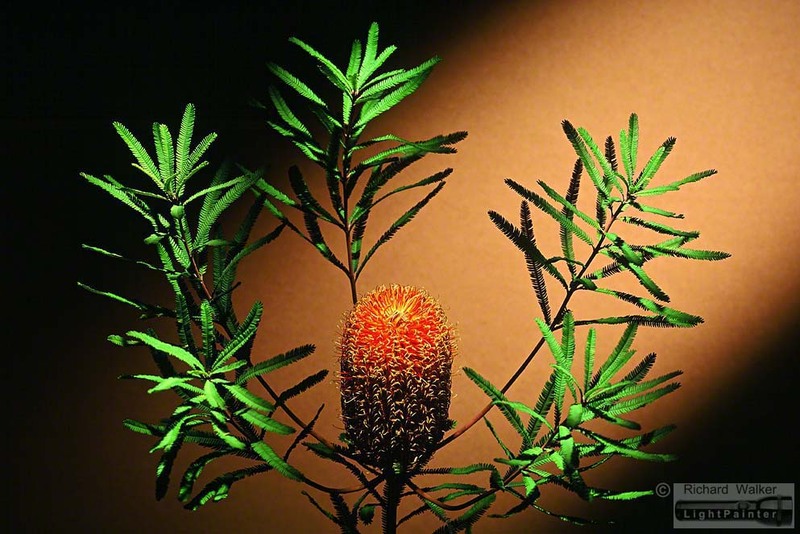 This particular banksia attracted me for two reasons – the central position of the flower and the delicate nature of its leaves. 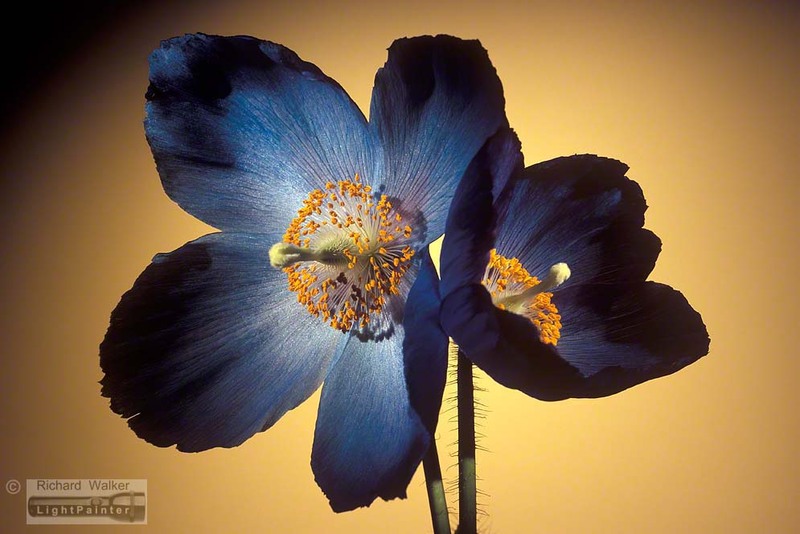 I am a great admirer of the lighting techniques used by the German-American fashion photographer Horst P. Horst (1906-1999). This is my tribute to his photographic style. My parents were not fanatical purists about Australian native plants, so I have memories of other exotic plants in our garden like a shady bed of Coleus (with its highly decorative variegated leaves), a trellis filled with flowering Sweet Peas, and the wafting fragrance from a Gardenia bush. My wife Helen and I have adapted and nurtured the gardens of six homes in our time together (yes, we’ve moved a lot!). We share a love of flowers and try to grow our favourites. These flowers were so exotic we had to grow them! We bought the seeds via mail order and planted just one pot. We watched their growth like anxious parents. As the flower buds developed, it became a waiting game: would I be away, travelling when the flowers opened; would all its flowers appear at once? Luckily, I was at home when these blooms opened so the pot went straight into the studio, in front of the camera. Of course like all gardeners, we can’t grow everything. So if Helen or I want to buy particular blooms we visit the Sydney Flower Market – a bustling warehouse of colour and perfume where seasonal flowers jostle for attention and florists respond with cash. 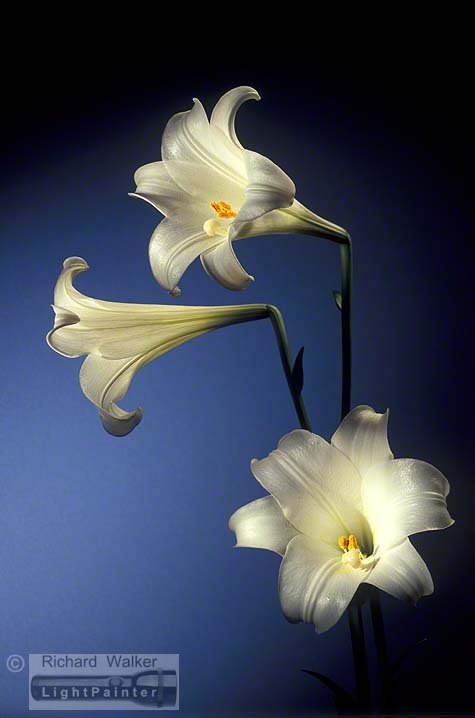 There is something about the way that lilies open that I find sensual and intimate. First their petals slowly part to reveal their inner sanctum. Then their stamens swell as they produce pollen. And finally their petals curl back until everything is on show. What I love about the flower market is the variety of blooms on offer and the opportunity for me to choose the best specimens for a studio shoot. When I’m working in macro mode, the lens and lighting accentuate every crinkle and blemish. So I am always on the lookout for perfect flowers. I’m intrigued by the translucence of petals. 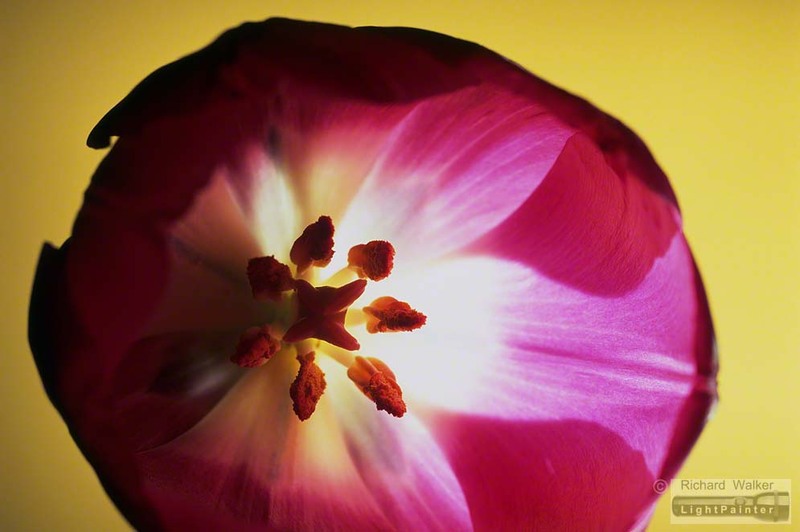 When I first looked into this open tulip and began positioning the camera for this close-up, I had no idea how I was going to light its beautiful interior. But once I fired up the Hosemaster and began to play with lighting positions, I realised that lighting through the petals was going to produce the most revealing shot. Another benefit of being at a flower market is that I get to meet the actual growers. On occasions I have been invited to visit their properties so I can choose the best specimens for a studio shoot. For me, it is a real privilege to enter the grower’s world and to see the care and attention they give their crop of flowers. To be standing in the field, surrounded by the practicalities of flower-growing is such a contrast to the showy atmosphere of the florist’s shop. 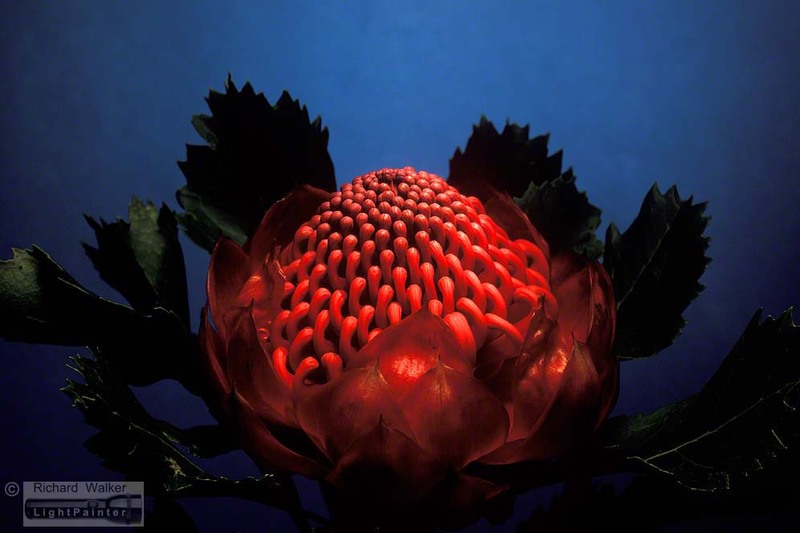 I was once invited to a waratah farm. It was a crisp October morning in the Blue Mountains, west of Sydney, and the usually scraggy waratah bushes were flush with these beautiful flowers. The grower and I walked up and down the rows of bushes selecting the best blooms. This stunning specimen was the pick of the bunch. In the studio I lit the flower so it appeared to radiate its beauty. There are other sources of flowers. I have had neighbours and friends call me to mention particular flowers in their gardens — wanting to know if I’m interested in photographing their specimens. My mentor, Robert Clark (an accomplished food photographer), grew a range of potted orchids in his backyard. One day he rang to offer me a spray of flowers. He was going on holidays and wanted me to see these blooms at their best. 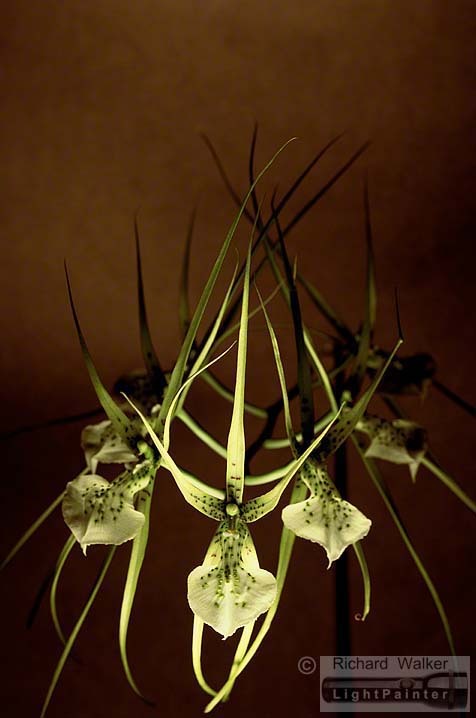 The next morning when I opened my front door I found a single stem of Brassia Orchids standing in a bottle of water. Rob was right – these orchids were exquisite. In the studio, my constant quest is to try to capture the essence of a flower — to find a new way of “seeing” each bloom. The shape of these orchids suggested dancers to me — perhaps cancan dancers at the Moulin Rouge in Paris. So I chose to light the flowers from underneath, to suggest footlights in a darkened theatre. What I find exciting about photographing flowers is the sheer diversity of subjects. There are hundreds of thousands of flowering plant species around the world and I have only just begun recording their images. My joy is finding a way of bringing these blooms into the studio and giving them the star treatment! Most of my light paintings are available as limited edition, archival prints (see the menu heading — Prints). My watermark does not appear on purchased prints.